» Messi! Messi! Messi! Messi! Messi! 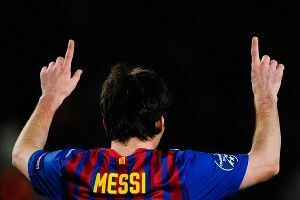 Lionel Messi scored five goals Wednesday in Barcelona’s 7-1 razing of Bayer Leverkusen, sending the defending Champions League trophy holders through to the quarterfinals. A lot of credit should go to Cesc Fabregas on this one, because of the perfectly timed and weighted lob. Helps when are you passing to the last living Jedi Knight, though. There’s about a millisecond of time and six inches of space where this shot actually comes off, much less goes past Leverkusen’s doomed keeper. Messi finds both. Notable mostly for the comedy pratfall on the part of the completely roasted Leverkusen defender who (perhaps unnecessarily) winds up tumbling into the net. It’s a testament to Messi’s greatness that most any other football player would cite this shot as a career highlight. Here, it’s Leo’s fourth-best goal of the game. Can we pass the hat for Leverkusen keeper Bernd Leno’s electroshock therapy? Tax-deductible, of course.